Several regional instruments also protect the right to freedom of expression, such as the European Convention on Human Rights (Article 10) (which does not apply to the Ugandan government), the African Charter for Human and Peoples’ Rights (Article 9) and the American Convention on Human Rights (Article 13) (which also does not apply to the Ugandan government). The Inter-American Commission on Human Rights also provides for a Special Rapporteur on freedom of expression, who drafted a Declaration of Principles on freedom of expression, which was adopted in 2000. Similarly, the African Commission on Human and Peoples’ Rights has also established a Special Rapporteur on freedom of expression in Africa. In fact in its 32nd Session, the African Commission adopted the Declaration of Principles on Freedom of Expression in Africa. Several commentators have argued that the best way for this right to be exercised fully is through a free press. In fact some scholars have called press freedom as the fourth estate, in the sense that it is through it that the three arms of the government can be checked. I will dwell on the importance of the media in the current 21st century especially for African countries, but will want to show that the media cannot and should not at any one time be attacked and or be shut down the way the Ugandan government did on 20 May 2013. The attack by the Ugandan government just happening barely 17 days before 3 May, a date which the United Nations General Assembly declared to be World Press Freedom Day to raise awareness of the importance of freedom of the press and remind governments of their duty to respect and uphold the right to freedom of expression enshrined under Article 19 of the Universal Declaration of Human Rights and marking the anniversary of the Declaration of Windhoek, a statement of free press principles put together by African newspaper journalists in 1991. From this provision one can expressly construe that, press freedom should not and cannot be attacked under whatever circumstances. This notion is well supported by reading Article 20 of the Constitution where it provides that, fundamentals rights under the constitution are not granted by the state, but by the fact that are inherent to an individual by being human. Hence it trite law to state that freedom of the press is fundamental towards achieving democratic society. In terms of case law supporting freedom of the media, there are numerous judgements to this effect I would be relying on two major case laws: Article 19 v Eritrea decided by the African Commission on Human and Peoples’ Rights in 2007 and Charles Onyango Obbo and Andrew Mujuni Mwenda v Attorney-General decided by the Supreme Court of Uganda in 2004. The former applies to Uganda by virtue of Uganda being a state party to the African Charter on Human and Peoples’ Rights. In Article 19, the African Commission condemned the banning of the press by the Eritrean government just as is the case by the Ugandan government and stated that banning the entire private press on the grounds that it constitutes a threat to the incumbent government is a violation of the right to freedom of expression, and that this is the type of action Article 9 of the Banjul Charter is intended to proscribe. A free press is one of the tenets of a democratic society, and a valuable check on potential excesses by government. In paragraph 108 of the said case, the Commission further states that no political situation justifies the wholesale violation of human rights; indeed general restrictions on rights such as the right to free expression and to freedom from arbitrary arrest and detention serve only to undermine public confidence in the rule of law and will often increase, rather than prevent, agitation within a state. Moreover, in the famous case of Charles Onyango Obbo, the Supreme Court of Uganda was in fact of the opinion that the right to freedom of expression extends to holding, receiving and imparting all forms of opinions, ideas and information. It is not confined to categories, such as correct opinions, sound ideas or truthful information. Subject to the limitation under Article 43, a person’s expression or statement is not precluded from the constitutional protection simply because it is thought by another or others to be false, erroneous, controversial or unpleasant. Everyone is free to express his or her views. Indeed, the protection is most relevant and required when a person’s views are opposed or objected to by society or any part thereof, as “false” or “wrong” (paragraph 18). The Supreme Court categorically stated that one can still and should be allowed to receive or disseminate information however unpleasant the same is. 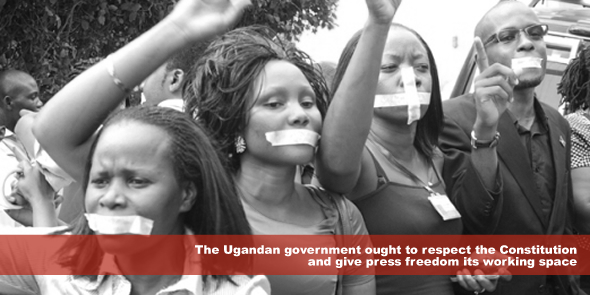 Therefore, Ugandan authorities cannot be heard saying that they are in fact protecting national security as they alleged in banning the press. National security is not an acceptable ground in limiting freedom of expression, according to The Johannesburg Principles on National Security, Freedom of Expression and Access to Information. The only acceptable grounds in limiting this fundamental freedom is when the same is proscribed by law, necessary in a democratic society and under permissible purposes for interference. None of this provides for national security as alleged by the Ugandan authorities on banning the Daily Monitor’s offices in Kampala. In conclusion the Ugandan government ought to respect the Constitution and give press freedom its working space, and if anything the government should always go to court in case the press is in violation of provisions of the law. William Aseka Oluchina has a Bachelor of Laws degree from Catholic University of Eastern Africa (CUEA). He works as a Program Assistant at Governance Consulting in charge of Human Rights Advocacy for Children with Disabilities and working as a Research Assistant at Musyoki Mogaka & Company Advocates. His research interest: human rights law in Kenya. Freedom of the press should not conduce to misinforming the masses/public. I should not amount to inciting discontent and racial/tribal/religious intolerance,etc.